Why are add-ons important? It lets you as a user decide what content you find good enough for the game. Every time the project leaders have to decide on what track or kart they should remove to make place for new ones, they know that they will get complaints. It's just how it is; you can't make everybody happy. But now we actually can, to some degree. Add-ons can be created or uploaded by anyone, so if something gets removed, users can quickly add it to the growing repository of additional content. The only requirements are regarding licensing, which should be one or more Free, preferably DFSG-approved licenses, and the content should not be offensive and suite people of all ages. In other words, content recently removed from the main game should slide right in. Quality or difficulty doesn't matter for an add-on; as long as it works and licensing etc. is okay, it gets approved by the moderators of the stkaddons website. As you can see, there's a definite interest in add-ons. If you manage to create a particularly good one, it may even go on to conquer the game! 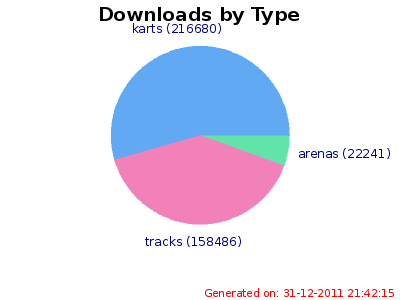 Or, in other words, become part of the default set of karts, tracks or arenas. 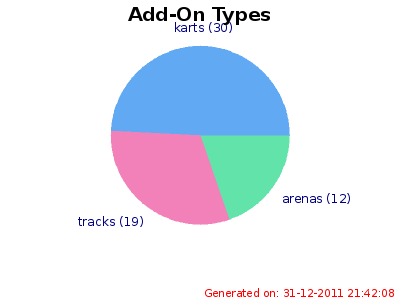 The addon manager is one of the best feautures of Super Tux Kart. The problem of having constantly growing packages has been is solved and a door for new contributors has been opened. As a result the quality of STK improved, since some old tracks in the main package could be replaced with better ones. Definitely you shall implement a P2P share downloading management. @Anonymous #2: I'm not so sure P2P downloading would come in the near future, particularly because we try not to add new dependencies to the game when it's not necessary. Also, for <10MB files it does not seem too practical. In the nearer future though, we were considering breaking add-ons into components so you do not need to download, for example, the same music track with several add-ons. This will save some download time. I updated the last SVNs ,opened it and clicked on "challenges" and nothing happened. Please fix that! Thank you! La prochaine version c'est pour quand?